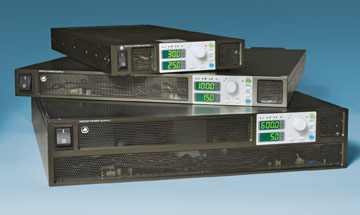 The Kepco Series KLN is a new family of RoHS compliant, automatic crossover, low-profile, high-performance, low-cost programmable power supplies. EPICS Driver (Linux compatible) now available! 2U high, full-rack package for 3,000W. 3U high, full-rack package for 5KW. 3U high, full-rack package for 10KW. 3U high, full-rack package for 15KW. Speed-controlled fans limit acoustic noise for bench top applications. For 750W, 1500W and 3000W, models, programming of output voltage, current and voltage and current limits may be achieved by analog means or by RS 485 digital control. GPIB or LAN interfaces are usually factory-installed options. Field installation Kit 219-0608 is available from Kepco to retrofit the LAN interface into a unit with the standard RS 485 interface. For Extended Range models, programming of output voltage, current, power and voltage and current limits may be achieved by built-in LAN (LXI) digital control. GPIB, USB, Serial Port (RS 422/RS 485) and Isolated Analog are factory-installed options. Two L brackets and attaching hardware are supplied with the unit. One L bracket is mounted to the U bracket supplied in the kit. The U bracket is then mounted to one side of the unit, and the second L bracket is mounted to the other side of the unit. The resulting configuration is one KLN with a blank filler panel (the U bracket) that can be installed in a 19-inch rack using the L brackets. Two L brackets and attaching hardware are supplied with the unit. With the two units side by side as they would be installed in the rack, one L bracket is mounted to the outer side of each unit. Two shoulder screws are then installed on the inner side of one unit. The shoulder screws are then inserted in the other unit and the unit with the shoulder screws is then slid forward until the panels of both units are flush. A small bracket supplied with the kit is used to secure the rear of the two units. The two units can now be handled as an assembly and installed directly into a 19-inch rack using the L brackets. Two L brackets and attaching hardware are supplied with each unit. With the L brackets attached the unit can be installed directly into a 19-inch rack. The 5KW, 10KW and 15KW models may be directly mounted in a 19-inch rack with no modifications required. KLN are CE Marked per the LVD, EMC and RoHS 2 Directives. See applicable Declaration of Conformity.